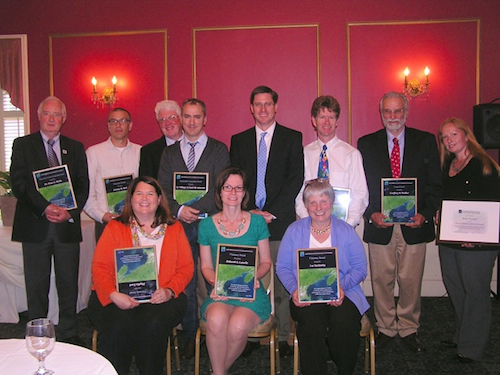 The Gulf of Maine Council on the Marine Environment (GOMC) annually presents several awards to people and groups doing important work around the Gulf. 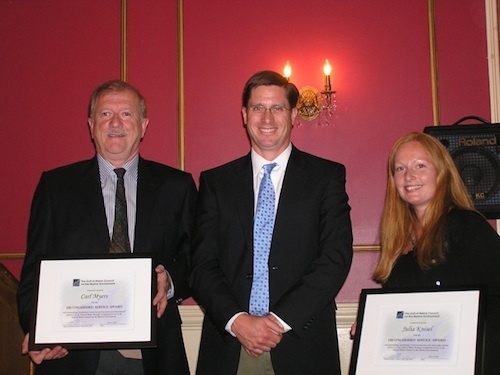 This year’s awards were presented at the Council’s annual meeting on June 12 at the Hawthorne Hotel in Salem, Massachusetts. Each year, the GOMC presents Gulf of Maine Visionary Awards to individuals or organizations within each of the five Gulf of Maine jurisdictions of Massachusetts, New Hampshire, Maine, New Brunswick, and Nova Scotia. These awards recognize innovation, creativity, and commitment to marine protection in the Gulf of Maine. Jeremy M. Bell is a Restoration Ecologist with 13 years of experience in both New England and the Pacific Northwest. For the last eight years Jeremy has worked primarily on coastal wetland restoration, first with the Massachusetts Office of Coastal Zone Management, and currently with the Massachusetts Division of Ecological Restoration in the Department of Fish and Game. He has provided exceptional leadership on some of the most complex coastal restoration projects in New England, including the NOAA stimulus-funded Stony Brook Restoration Project in Brewster, MA and the NRCS Cape Cod Water Resources Restoration Project. Jeremy has secured over $3 million in federal grant funding and has helped project teams complete 16 projects in Massachusetts resulting in acres of restored habitat. The recipient of three Coastal America Partnership Awards, Jeremy applies his technical knowledge and seasoned practical experience to form strong partnerships and works tirelessly to guide teams through the often treacherous minefield of project implementation. Most recently, Jeremy helped navigate the Freeman’s Pond project in Brewster, Massachusetts through a contentious legal challenge by providing expert testimony, exhibiting a strong will to persevere. That appeal was thwarted on all counts and the project is now under construction. Jeremy represents the Division of Ecological Restoration on the board of the Society for Ecological Restoration’s New England Chapter. He is also currently helping the commonwealth of Massachusetts develop new guidance for innovative projects that address nutrient pollution in estuaries—a critical problem facing many coastal communities in the Gulf of Maine. Jeremy’s tactful problem-solving skills, leadership abilities, and overall can-do attitude make him a well-respected colleague and valuable member of the ecological restoration community. Chris played a key role as part of the team that managed the American Recovery and Reinvestment Act funded Stony Brook effort and successfully restored 20 acres of tidally restricted salt marsh, restored river herring passage, reduced runoff into Stony Brook/Paine’s Creek, and is currently working on Freeman’s Pond to restore an additional 22 acres of tidally restricted salt marsh surrounding a salt pond. He received the NOAA Excellence in Restoration award in 2011, and was part of the team who won the Coastal America Partnership Award in 2012. Chris has also worked tirelessly to engage numerous people into joining the Brewster FLATS volunteer groups, thereby expanding the programs of the Natural Resources Department without increasing the annual town budget. Laurel Cox is a land protection specialist, conservationist, and community organizer, part of a family who practices organic farming, and a devoted wife and mother. Her manner, experience and knowledge enable her to empathize with people in many difficult situations and select areas of agreement that lead to positive action for land protection. Her work was essential in conserving more than 2,700 acres along New Hampshire’s Lamprey River and its tributaries, and some 955 acres in the Oyster River watershed—both of which drain into the Great Bay Estuary. Formerly one of the most pristine bodies in the Gulf of Maine region, the Great Bay is under many threats now that stem from a growing human population. Building bridges of understanding and action between seemingly diverse interests such as agriculture and conservation is of special interest to Laurel. Through her effective partnering with many organizations, she has been influential in combining the two effectively. For example, her knowledge of both farming and land protection recently combined with the efforts of The Nature Conservancy and the Great Bay Partnership to protect an 80-acre farm with 1,700 feet of frontage on the Lamprey River in Lee. Her vision and abilities combine a gentle style with rock-hard determination to protect land, heritage and community, thereby serving to protect the Lamprey and Oyster River watersheds, the Great Bay estuary, and, ultimately, the Gulf of Maine. infrastructure risk, cultural and social considerations, to name but a few. Yet, year after year, Deb Loiselle demonstrates her ability to orchestrate an average of 15 to 20 projects. To date, Deb and her project partners have restored 160 miles of rivers through removal of 17 dams in New Hampshire with 10 of those in the Gulf of Maine. downstream of a Superfund site, a separate oil seep was discovered, and budget shortfalls developed. As with all projects that Deb is involved with, the Souhegan River Restoration Project is destined to succeed thanks to her vision, tenacity, innovative problem solving skills, and project management experience. this environment, Deb continues to facilitate in a fair, balanced manner, hearing all sides before making decisions, and continuing to be inclusive of all stakeholders. Her ability to persevere through this project alone would be enough to garner her a nomination for a Visionary Award, yet, it’s important to remember that this project is but one of twenty that Deb currently manages. Deb is a program of one and she knows how to grow and sustain professional and personal relationships. She leads by example, brings out the best in others, and continually inspires those fortunate enough to work with her. She is a true visionary, an inspiration to us all, and her river restoration legacy will benefit the Gulf of Maine for centuries to come. Ron Beard has served as a University of Maine Cooperative Extension faculty member for over three decades, and as a member of the Maine Sea Grant/Cooperative Extension Marine Extension Team for more than 15 years. Ron is based in Hancock County, Maine, but the impacts of his work stretch throughout the state and beyond. His work is focused on community development education, and includes group process facilitation, coordination, and organizational development related to sustainable community and economic development initiatives and marine and coastal resource management issues. His work also provides opportunities for citizen education and public discussion of these issues. Ron is a gifted and well-practiced facilitator, and his work serves as a model for others who are learning facilitation and group process skills. He has played an important capacity-building role within the University of Maine and Maine Sea Grant, and in many other public and nonprofit organizations throughout the state and region. Coordinating MDI Tomorrow, a community visioning and planning process for Mount Desert Island communities. Facilitating science and policy discussions related to (often contentious) marine and coastal resource management issues, such as commercial rockweed harvesting in the intertidal zone. Coordinating and facilitating sustainable community and economic development processes, such as for the Schoodic Peninsula in Downeast, Maine, following closure of a Navy communications base. Since 1993, Ron has also produced and hosted Talk of the Towns radio program, an hour-long interview and call-in program on WERU community radio. In December 2013, Ron will retire from his 32-year career with the University of Maine Cooperative Extension and Maine Sea Grant, but the legacy of his work will stay with both organizations, and with communities he has touched throughout coastal Maine and beyond. 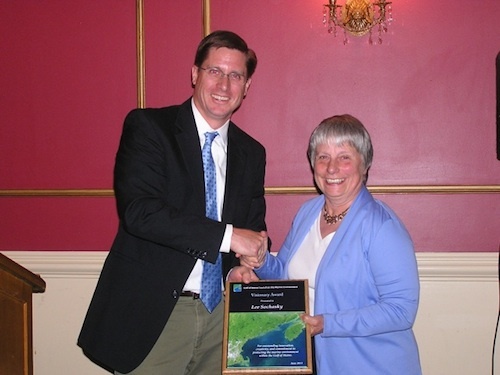 For more than a decade, Phyllis Ford has made a tremendous contribution to protecting and improving coastal resources in Southern Maine. Under her volunteer leadership, a group of Kittery and Kittery Point residents came together to form the Spruce Creek Association. Today, more than 200 volunteer members of the Spruce Creek Association work together as environmental stewards to evaluate and restore natural resources of the Spruce Creek watershed. Providing educational programs for town officials, business owners, students and residents on environmental issues affecting Spruce Creek and how to make a difference. On behalf of the Gulf of Maine Council, I would like to commend Phyllis for having the vision and personal commitment to bring people together to make a difference in the Gulf of Maine. Her countless hours of volunteer leadership and hard work are a true testament to environmental stewardship at the local level. 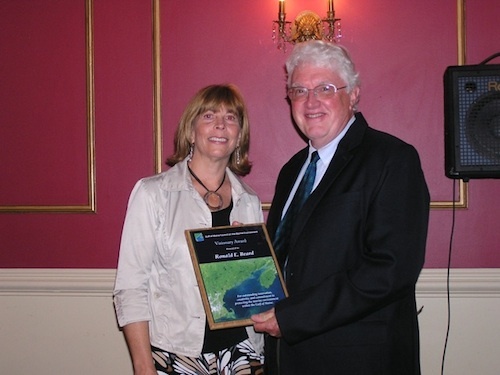 Lee Sochasky has worked to protect and enhance the environmental quality of the Gulf of Maine for the last 30 years. She has worked on both sides of the border with a wide range of communities and stakeholders. Lee has countless admirable traits, however her philosophy of always approaching a situation in an honest and positive light is one we could all emulate. Lee was the Director of the St. Croix International Waterway Commission from 1989 – 2011. In this capacity, she worked with government agencies, communities, environmental and other groups in both Maine and New Brunswick in the St. Croix River watershed. A member of the town Counsel of St. Andrews and a member of the Planning Advisory Board, Lee also works with the IJC International Watershed Board for the St. Croix and the Passamaquoddy on opening the river to alewives. And, she is currently working with a group called “Save Ocean Science” to retain the library at the St. Andrews Biological Station and address the cutbacks to the contaminants and toxicology programs. For more than 30 years, Lee has demonstrated her commitment to the Gulf of Maine by either writing or presenting papers, speaking with groups and media, and doing so in a professional and ethical manner. Lee’s enthusiasm, commitment and hard work are widely admired and she clearly deserves the Gulf of Maine Visionary Award. Although he could not join us tonight, I am pleased to present the Council’s next Visionary Award to Dr. Gareth Harding, a retired Emeritus Research Scientist at the Bedford Institute of Oceanography in Nova Scotia. Gareth has been a dedicated researcher for over 40 years, exemplifying the commitment of knowledge, skills, time and energy demanded of an outstanding marine environmental scientist. He spent his very productive career at the Bedford Institute of Oceanography, conducting fundamental research on marine zooplankton and chemical contaminants, including the use of blue mussels as biological monitors of marine chemical contamination in the Bay of Fundy and Gulf of Maine, as part of the Gulfwatch program of the Gulf of Maine Council. Dr. Harding served the Council as an original member and early Canadian Co-Chair of the Gulfwatch team (the Gulfwatch Chemical Monitoring Sub-Committee), participating in all aspects of this seminal monitoring program since it began in 1991. He has been an outstanding leader, noted for his hard work, enthusiasm and sense of humor. He has contributed to the Gulfwatch group’s reports and primary publications as an active writer and reviewer, so important due to his extensive knowledge of chemicals in the sea. Gareth continues to be an active volunteer member each year, collecting and processing samples at distant coastal sites in Nova Scotia, and contributing to data interpretation and reports. Gareth sets the bar very high for excellence in science and is a fine example for younger scientists. He is being recognized for his past and on-going service to the GOMC through Gulfwatch, and his life-long commitment to marine environmental science, protection and conservation. The accomplishments of the Gulf of Maine Council are made possible by the many individuals who serve as members of the Council, Working Group, and committees. Through their collaborative efforts, the Gulf of Maine Council makes significant strides each year in protecting and restoring natural resources in the Gulf of Maine. The following individuals were recognized for providing exceptional service to the Gulf of Maine Council on the Marine Environment over the past several years. As an organization that operates in two countries with three states and two jurisdictions, coordinating the activities of the Gulf of Maine Council is no small challenge. For the past 18 years, Michele Tremblay has worked to guide the Council’s many volunteers and partners toward achieving measurable outcomes and a sustained positive impact on protecting and restoring natural resources in the Gulf of Maine. The Gulf of Maine Council prepared a special award to thank Michele for her long-time contributions. is to have knowledge of things that are as nearly eternal as any earthly life can be. It is with great appreciation and deep gratitude that we recognize Michele Tremblay for her many years of dedicated and professional work for the Council, its member organizations, and partners and her exceptional commitment to and achievements with the Council and its mission in the Gulf of Maine. The Susan Snow-Cotter Leadership Award is bestowed in memory of Susan Snow-Cotter, a long-time friend of the Council and Working Group. This special award is given to an individual from one of the five states and provinces bordering the Gulf of Maine. 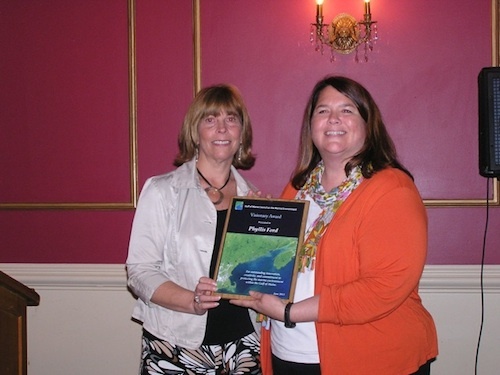 The Susan Snow-Cotter Leadership Award honors a coastal management professional who exemplifies outstanding leadership or exceptional mentoring in the Gulf of Maine watershed. 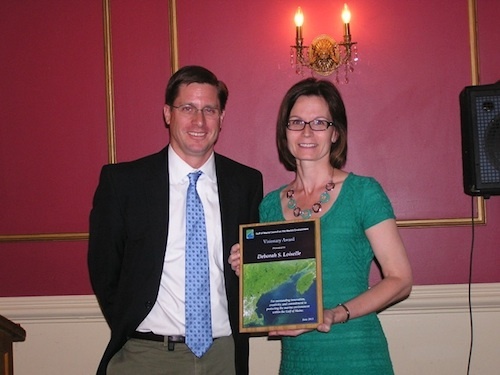 As former Director of the Massachusetts Office of Coastal Zone Management, Susan was recognized as a leader who exhibited unwavering passion, enthusiasm, and insight to develop pragmatic approaches to coastal management challenges. 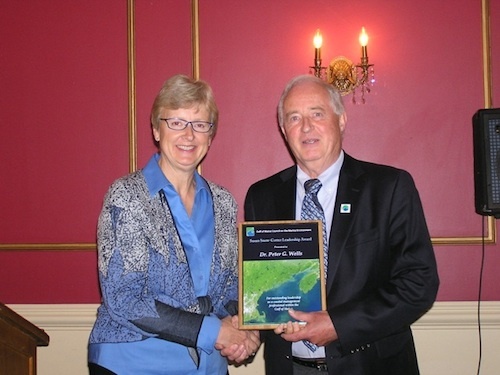 This year, we are very pleased to honor Dr. Peter Wells of Halifax, Nova Scotia, with the Susan Snow-Cotter Leadership Award for demonstrating exceptional leadership in coastal and ocean management. Peter has spent his entire career working to protect and improve marine life in the Gulf of Maine—first as a marine scientist, and then as an educator and volunteer. For more than 34 years, he worked on protecting coastal resources for the Canadian federal government, most recently as Head of the Coastal and Water Science Section, and Senior Research Scientist focused on Coastal Ecosystems. After ‘retiring’ from Environment Canada, Peter began pursuing further teaching, research, and writing on marine environmental issues. He is currently a Professor at Dalhousie University, in the School for Resource and Environmental Studies, the Marine Affairs Program, and School for Information Management, and a Senior Research Fellow at the International Ocean Institute, in Halifax, NS. Peter has been a staunch supporter and active volunteer with the Gulf of Maine Council since 1989. He is a member of the Working Group and currently serves as Canadian Co-Chair of the Gulfwatch committee. Under Peter’s leadership, Gulfwatch has measured contaminants in blue mussels to evaluate pollution in the nearshore marine environment for over two decades. This Gulf-wide regional monitoring program has provided important baseline data as well as valuable information about trends of chemical contaminants in coastal waters at 56 locations throughout the Gulf of Maine and Bay of Fundy. In addition to his volunteer work with the Council, Peter is also an active member and past Chair of the Bay of Fundy Ecosystem Partnership. Whether conducting scientific research, mentoring students, writing about the Gulf of Maine, or volunteering—Peter brings excellence, passion and dedication to all of his endeavors. As a small token of our thanks for his efforts, I am very pleased to present Peter with this Susan Snow-Cotter Leadership award. 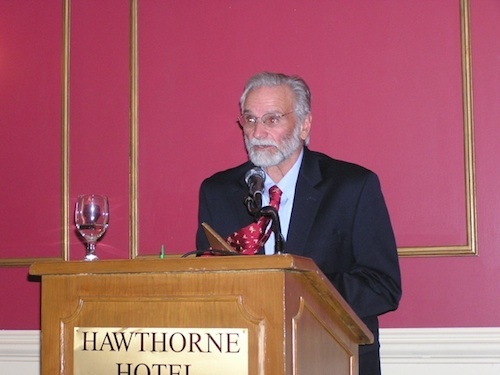 The Longard Award is bestowed each year in memory of Art Longard, a founding member of the Gulf of Maine Council on the Marine Environment and long-time Working Group member. 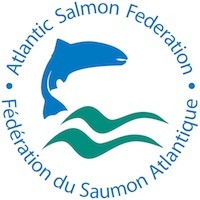 This Award is given to an individual from one of the five states and provinces bordering the Gulf of Maine to recognize volunteer commitment to environmental protection and sustainability within the Gulf of Maine. It is an honor to present this year’s Longard Award to Geoffrey Walker for outstanding volunteer efforts to protect and conserve natural resources within the Gulf of Maine. Geoffrey lives in Newbury, Massachusetts in a house overlooking his beloved Great Marsh, Plum Island Sound, and the Parker River Wildlife Refuge. As the son of a legendary hunter, conservationist, artist, and state legislator, Geoffrey was raised in an atmosphere that allowed him to become the avid sportsman and wildlife activist that he is today. At 10 years old his favorite pastime was floating on “joppa flats” and hunting over his father’s decoys. Those days gave him a unique opportunity to experience a now by-gone era of water fowling, when equipment was simple and carefully handcrafted, and the bag limit was seven blacks. Exuding a feel from decades past with sneak boats, old outboard motors, and his father’s original marsh art works, his studio and workshop stand as a tribute to the traditions of hunting and a hope that important history and traditions will never be lost. Geoffrey is a dedicated water fowler, talented decoy maker and true conservationist whose goal is to foster a love and respect of local heritage and traditions. His craftsmanship has been exhibited and admired at galleries in New York City, Nantucket and Palm Beach, Florida. Geoffrey is active in Ducks Unlimited, the local Rotary, and the Town of Newbury, where he is a selectman and has held positions on the planning board, conservation commission and other town committees. Through active participation in Eight Towns and the Great Marsh Committee and the Great Marsh Revitalization Task Force, Geoffrey has promoted access to a clean and well managed marsh. He has worked tirelessly as a volunteer for many years to promote and restore marsh habitat through the removal of tidal restrictions, combating invasive marsh plants, and restoring oysters and eelgrass in the Great Marsh. It is my pleasure to present Geoff Walker with this year’s Longard Award as a token of thanks for his efforts to protect this special salt marsh habitat within the Gulf of Maine. This year, the Gulf of Maine Council created a new Sustainable Communities Award to recognize a community, or group within a community for exemplary work in achieving sustainable outcomes related to the environment and economy within the Gulf of Maine. Our winner, Le Village en haut du ruisseau in Dieppe, New Brunswick is an outstanding example of community development built upon the foundations of environmental, social, and economic sustainability. Few subdivision projects in New Brunswick have generated as much interest and kudos as the one called Le Village en haut du ruisseau located in Dieppe, New Brunswick. This project is the first conservation subdivision built in the Province. Le Village en haut du ruisseau has been in the making since 2005 and saw its first residents in 2010. The project, developed with an exhaustive consultation process that included a long list of stakeholders has produced a truly community project in the City of Dieppe. This unique 30-acre property provides 217 residential housing units while 76 percent of the property has been protected in perpetuity. Best Management Practices for managing storm water have been incorporated throughout the project area. All rain on the site is treated naturally before draining to the environment. Most of the units have the main portion of their facade orientated in a southerly direction taking full advantage of energy efficiency, while being protected from dominant winter winds by natural tree cover; 20 percent of all the units are considered affordable, and the project will generate about $40 million in sales revenue for the builder versus a maximum of $2.5 million in sales revenue if the project had been built in a conventional layout without incorporating the principles of Conservation Design. The project generates annual property tax revenues of $620,000 for the City of Dieppe versus $40,000 if built in the conventional manner. By incorporating the Conservation Design approach to this residential subdivision, residents and the community got parkland and open space, the City maximized its property tax revenues, and the builder benefited enormously by generating 16 times more sales revenue for building the maximum amount of units within the same amount of space. The overall silent winner though might just be the watershed, the tidal wetlands, the mighty Peticodiac River, the Bay of Fundy, and the Gulf of Maine whose health will be protected. The Le Village en haut du ruisseau residential development project is truly a WIN, WIN, WIN situation for the residents, the city, the community, and the environment.